Toss the strawberries with the sugar in a medium bowl. Unfold the pastry sheet on a lightly floured surface. Cut the pastry into 3 strips along the fold marks. Cut each strip into 3 squares, and cut each square into quarters, making a total of 36 (1 1/4-inch) squares. Place the squares 1-inch apart on greased or parchment-lined baking sheets. Bake the pastries for 15 minutes or until they're golden brown. Remove the pastries from the baking sheets and cool them on wire racks. Split each pastry into 2 layers. Spread 1 tablespoon whipped topping on each of 36 bottom layers. 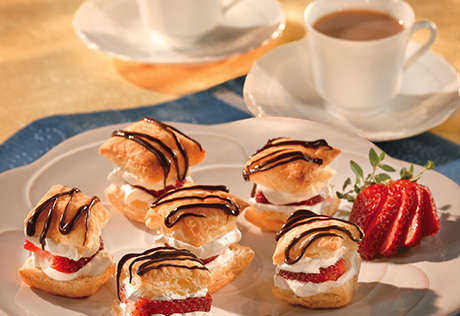 Top each with 1 strawberry slice, 1 tablespoon whipped topping and a top pastry layer. Drizzle the chocolate over the pastries. Ingredient Note: For 4 cups sweetened whipped cream, beat 2 cups heavy cream, 1/4 cup sugar and 1/2 teaspoons vanilla extract in a large bowl with an electric mixer on high speed until stiff peaks form. Alternate Preparation: For holiday celebrations with a red- white-and-blue theme, use a combination of 1 1/2 cups each strawberry slices and blueberries and divide evenly among the pastries.